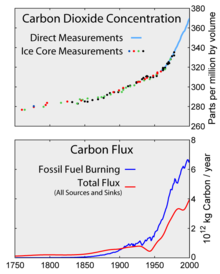 ^ "NASA GISS: Science Briefs: Greenhouse Gases: Refining the Role of Carbon Dioxide". www.giss.nasa.gov. Retrieved 26 April 2016. ^ ESRL Web Team (14 January 2008). "Trends in carbon dioxide". Esrl.noaa.gov. Retrieved 11 September 2011. ^ Mann, Michael E. (1 April 2014). "Earth Will Cross the Climate Danger Threshold by 2036". Scientific American. Retrieved 30 August 2016. ^ a b Forster, P.; et al. (2007). "2.10.3 Indirect GWPs". Changes in Atmospheric Constituents and in Radiative Forcing. Contribution of Working Group I to the Fourth Assessment Report of the Intergovernmental Panel on Climate Change. Cambridge University Press. Retrieved 2 December 2012. ^ "Methane's Impacts on Climate Change May Be Twice Previous Estimates". Nasa.gov. 30 November 2007. Retrieved 16 October 2010. 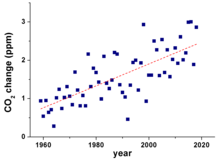 ^ "Climate Change Indicators: Atmospheric Concentrations of Greenhouse Gases". Climate Change Indicators. United States Environmental Protection Agency. Retrieved 20 January 2017. ^ "AGU Water Vapor in the Climate System". Eso.org. 27 April 1995. Retrieved 11 September 2011. ^ "How long will global warming last?". RealClimate. Retrieved 12 June 2012. ^ Chandler, David L. "How to count methane emissions". MIT News. Retrieved 20 August 2018. Referenced paper is Trancik, Jessika; Edwards, Morgan (25 April 2014). "Climate impacts of energy technologies depend on emissions timing" (PDF). Nature Climate Change. 4: 347. Archived from the original (PDF) on 16 January 2015. Retrieved 15 January 2015. ^ Intergovernmental Panel on Climate Change (17 November 2007). "Climate Change 2007: Synthesis Report" (PDF). p. 5. Retrieved 20 January 2017. ^ Siegel, Ethan. "How Much CO2 Does A Single Volcano Emit?". Forbes. Retrieved 6 September 2018. 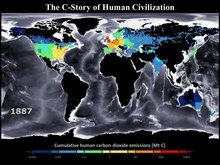 ^ "The present carbon cycle – Climate Change". Grida.no. Retrieved 16 October 2010. ^ Ciais, Phillipe; Sabine, Christopher; et al. "Carbon and Other Biogeochemical Cycles" (PDF). In Stocker Thomas F.; et al. (eds.). Climate Change 2013: The Physical Science Basis. IPCC. p. 473. ^ a b c Grubb, M. (July – September 2003). "The economics of the Kyoto protocol" (PDF). World Economics. 4 (3). Archived from the original (PDF) on 17 July 2011. ^ Johnston, Chris; Milman, Oliver; Vidal, John (15 October 2016). "Climate change: global deal reached to limit use of hydrofluorocarbons". The Guardian. Retrieved 21 August 2018. ^ Newbold, Richard (19 May 2014), A practical guide for fleet operators, returnloads.net, retrieved 20 January 2017. ^ Jeanne Royer, Sarah-; Ferrón, Sara; T. Wilson, Samuel; M. Karl, David (1 August 2018). "Production of methane and ethylene from plastic in the environment". PLOS One. 13 (Plastic, Climate Change): e0200574. doi:10.1371/journal.pone.0200574. PMC 6070199. PMID 30067755. ^ a b Bader, N.; Bleichwitz, R. (2009). "Measuring urban greenhouse gas emissions: The challenge of comparability. S.A.P.I.EN.S. 2 (3)". Sapiens.revues.org. Retrieved 11 September 2011. ^ World energy outlook 2007 edition – China and India insights. International Energy Agency (IEA), Head of Communication and Information Office, 9 rue de la Fédération, 75739 Paris Cedex 15, France. 2007. p. 600. ISBN 978-9264027305. Retrieved 4 May 2010. ^ Markandya, A. (2001). "7.3.5 Cost Implications of Alternative GHG Emission Reduction Options and Carbon Sinks". In B. Metz; et al. (eds.). Costing Methodologies. Climate Change 2001: Mitigation. Contribution of Working Group III to the Third Assessment Report of the Intergovernmental Panel on Climate Change. Print version: Cambridge University Press, Cambridge and New York. This version: GRID-Arendal website. doi:10.2277/0521015022 (inactive 18 February 2019). ISBN 978-0521015028. Archived from the original on 5 August 2011. Retrieved 11 April 2011. ^ Herzog, T. (November 2006). Yamashita, M.B. (ed.). Target: intensity – an analysis of greenhouse gas intensity targets (PDF). World Resources Institute. ISBN 978-1569736388. Retrieved 11 April 2011. 2 emissions: annual increase halves in 2008". Netherlands Environmental Assessment Agency (PBL) website. 25 June 2009. Retrieved 5 May 2010. ^ "Global Carbon Mechanisms: Emerging lessons and implications (CTC748)". Carbon Trust. March 2009. p. 24. Retrieved 31 March 2010. ^ Vaughan, Adam (7 December 2015). "Global emissions to fall for first time during a period of economic growth". The Guardian. ISSN 0261-3077. Retrieved 23 December 2016. 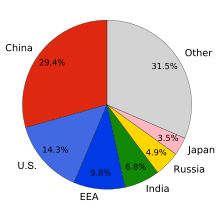 2 Emissions" (PDF). Proceedings of the National Academy of Sciences of the United States of America. 107 (12): 5687–5692. Bibcode:2010PNAS..107.5687D. doi:10.1073/pnas.0906974107. PMC 2851800. PMID 20212122. Retrieved 18 April 2011. ^ "Greenhouse Gas Emissions from a Typical Passenger Vehicle" (PDF). Epa.gov. US Environment Protection Agency. Retrieved 11 September 2011. 2, Slate Magazine". Slate Magazine. Retrieved 11 September 2011. ^ "Volume calculation for carbon dioxide". Icbe.com. Retrieved 11 September 2011.